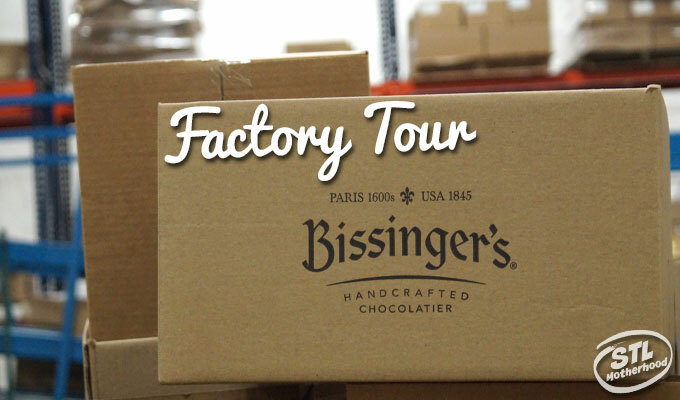 Wonder no more, because you can tour Bissinger’s Chocolate Factory and see for yourself! Bissinger’s is famous for it’s handcrafted chocolate and a family tradition that dates back to 17th century France. Karl Bissinger opened shop in St. Louis in 1927 and has been delighting chocolate connoisseurs ever since. Now I’m not going to lie to you–Bissinger’s is gourmet chocolate, and it’s priced accordingly. But once you’ve had a taste, you’ll understand why Bissinger’s is so very, very good. The factory is a couple blocks north of the Dome Who Shall Not Be Named on N. Broadway. It’s a quite street here and the factory sits in the shadow of the beautiful Stan Musial bridge, an area that’s part of the old St. Louis’ revival. This building was once the home of Switzer’s Licorice, and Bissinger’s gave it a huge remodel in 2014 before moving their factory here. By the way, you’re just a hop and a skip from Crown Candy, so go ahead and plan to have lunch there after the tour. You know you want to! Then it’s time to suit up! Please note that cameras and cell phones are not allowed on the factory floor, and you’ll be asked to remove all jewelry and wear a hair net and put on a Bissinger’s lab coat. Don’t worry, they’ll loan you a locker in the Candy Shop, I just want you to be prepared. It’s a safety thing. And yes, you might feel a little like Lucy and Ethel, especially if you bring your bestie. Even the kids get to suit up! Jen and I were allowed to bring our camera’s so we could blog about the tour. I know it seems silly, but candy is serious business here and they don’t want any of their famous chocolate making secrets to get out! You can take photos in the Candy Shop, but then you’ll need to stash that phone in the locker. You’ll get to walk around the factory floor and learn how chocolate candies and confections are made. When we visited they were prepping chocolate bunnies for Easter as well as making signature gummy pandas and chocolate truffles. The thing I really noticed was the number of employee’s working in the room. This is HANDMADE chocolate, no joke. Sure, they have a few gadgets and gizmos, but our guide was happy to point out that each piece of chocolate passes through seven employees from start to finish. That’s seven people to make sure that everything is just right! We were able to see how they make lots of different chocolates, from molded bunnies and truffles to toffee and chocolate covered grapes. You can see in the photo below that they still make candy in small batches with copper bowls, just like the old days. But the most impressive thing in the entire factory? Giant freaking boxes of solid chocolate sitting in the warehouse just waiting to become something glorious. Bissinger’s chocolate comes from the Ivory Coast and a lot of it is sourced from Rainforest Alliance Certified™ Farms. That’s fair trade chocolate and knowing the farmers who grew my chocolate are getting a good price makes ever bite even sweeter, don’t you think? Oh and don’t worry. That box won’t sit there long. Chocolate has a short shelf life, and Bissinger’s wants to make sure you can savor that box of finished chocolates you take home. Here’s something from their website that explains it better! 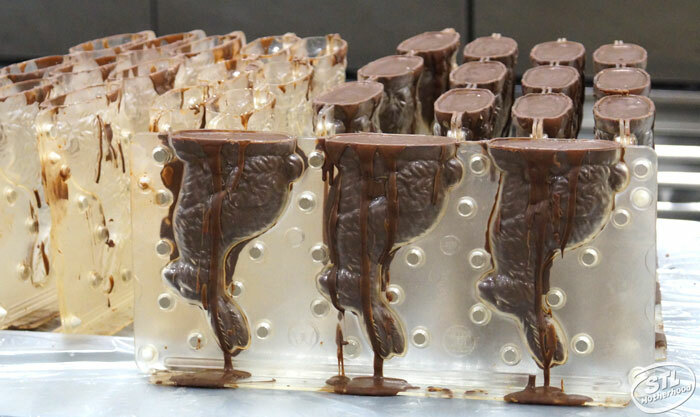 What is the shelf life of Bissinger’s confections? Many of the recipes used to craft our confections were created in a time where refrigeration was scarce. Therefore, they needed to be able to last, while still retaining their high-quality taste. Because we still use many of those original recipes today, our products have retained their long shelf life, lasting approximately 6-9 months without the assistance of additives or preservatives. It’s easy to take the tour, but they’re only offered Monday-Thursday at 10am. You’ll need to RSVP in advance by sending them an email–check the Bissinger’s website for details here.